The Legion of Mary was founded in Dublin in 1921 by Frank Duff and has grown into the largest catholic lay organisation in the world. This fascinating documentary attempts to understand the man behind this religious phenomenon and compiles evidence that the Legion of Mary represent one of the most important movements ever to emerge in Ireland. Eight million Legionaries in 191 countries pray daily for the canonisation of Frank Duff. Des Geraghty re-lives the 1913 Lockout in its centenary year. With original artwork, music and dramatic reconstruction, this documentary unpicks the characters and events of this monumental strike. The Lockout led to violent class conflict on the streets of Dublin with social and political reverberations that can be felt to this day. Directed by Brian Gray. Will it be a white Christmas? Is the snow and frost going to paralyse the country again? What type of summer will we have? Every year bookmakers, farmers, ice cream companies, bus and car drivers are increasingly hanging on the word of a little postman from Donegal who has been accurately predicting the weather. A new documentary from Brian Gray follows Michael Gallagher on his postal rounds and gets an insight into his gift for weather prediction, the people he meets and how his skills have been handed down to him from an isolated community from deep within the Bluestack mountains. When Irish missionaries went to the developing world in the 1960s, they went to many countries characterized by extreme wealth and extreme poverty. And they faced other problems – the experience of political oppression, injustice and poverty was to change many missionaries. This four part series, generously illustrated with archive footage recounts the experience of missionaries in Brazil, the Philippines and El Salvador. Happiness is found in unusual places. For the men in this COGAR, happiness is a rusted heap of metal. It is pistons, head gaskets, crankshafts and draughty sheds. It is loving something back to life. And noisily driving through highways and byways at five miles an hour following a line of your friends. 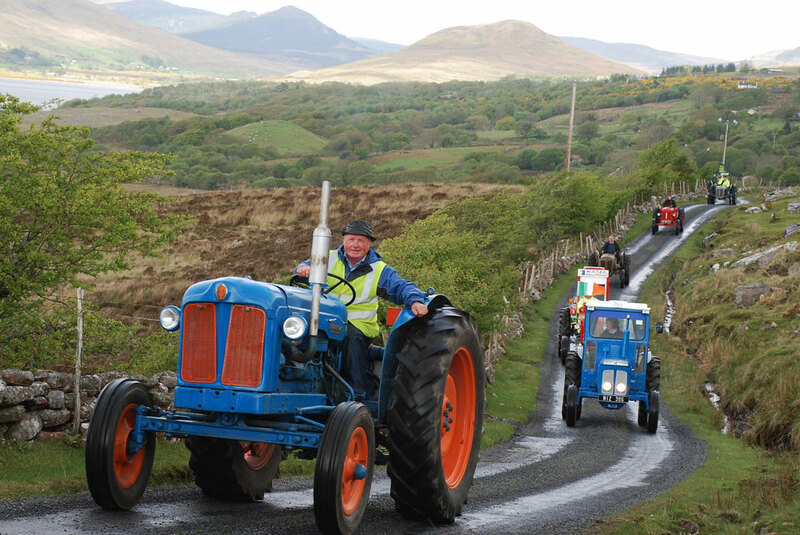 TARRAINGT TARRACÓIRÍ is a glimpse into the world of vintage tractors and the men who restore them. Directed by Mary Brophy. The 1918 influenza pandemic was the greatest killer the world has ever known. Over the course of 12 months, fifty million people died and a billion people fell ill with this influenza. Aicíd tells the story of the 1918 influenza pandemic in Ireland. It attacked people of all ages and classes and reached every corner of the country. 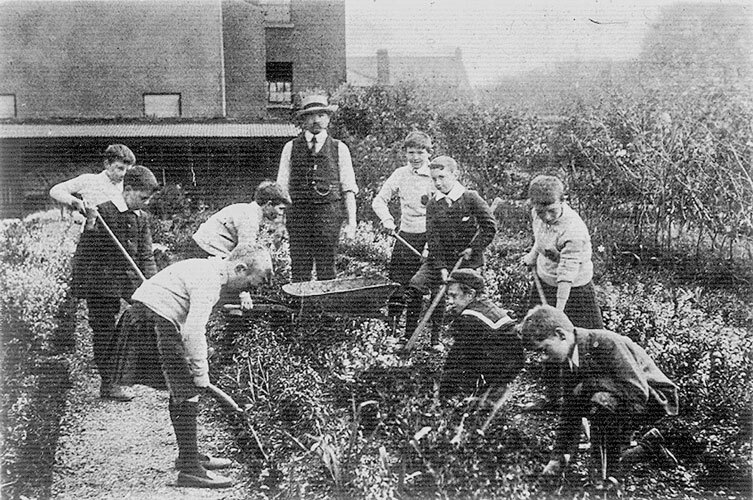 Schools were closed, work was disrupted and lives were in chaos, even the 1918 GAA football finals were postponed. With dramatic reconstructions and original research, this documentary reveals, for the first time, the earliest recorded outbreak of the 1918 influenza in Ireland. In the 17th century, the mystic Seer Brian Rua O Cearbhain, prophesised that fire carriages on iron wheels would one day come to Achill Island. And that the first and the last carriage would carry the dead. In this week’s Cogar, Tairngreacht Acla, the people of the island tell the story of the Achill Branch line and the chilling consequences of this macabre prophesy. Directed by Neal Boyle. A four part documentary series recounting the experience and challenges of the Emigrant chaplains who worked in the UK and in America offering pastoral support and welfare services to waves of Irish emigrants since the 1960s. The series also draws parallels with immigrant communities to Ireland and their chaplains. While many people associate Knock Shrine with only one person, the legendary Canon James Horan, this COGAR tells the extraordinary story of Knock’s heroine – Dame Judy Coyne. In the 1930s, she, with her husband Liam, revived national interest in the then almost forgotten shrine. She spent a lifetime working to promote Knock Shrine and one Sunday morning in 1964, Judy Coyne got the idea that the Pope should come to Ireland… Directed by Mary Brophy. Cesca Trench was a nationalist activist of ascendancy background. Her diaries are written in Irish, English and French. Born in England of Irish parents, following the death of her father the family moved under the wing of the Irish big house, to the care of the Trench family who were loyal to their kin. As a modern descendant of that house has noted, she mixed with *Gaelic Protestants*, but contained within these families were landlords and social reformers, British Army officers and Irish Volunteers, Conservative M.P.s, Irish Unionists and Irish Nationalists. Through the life of Cesca Trech, her involvement in Conradh na Gaeilge, Cumann na mBan, Cumann Gaelach na hEaglaise, Irish Volunteers and others, the contradictions and the tensions of that world come centre stage to mark the diverse and complex 90th anniversary of the 1916 Easter Rising. The “An Dún” restaurant on Galway’s Inis Meáin lists “Concannon, from the Livermore vineyard in California, which has local connections” on its wine list. Concannon wine? What was the connection? Who, indeed, was Concannon? Fíniúin Inis Meáin chronicles the remarkable story of James Concannon’s journey from the rocks of Aran to the rocks of Livermore, California. This truly fascinating man of Aran who kept heading west, left Inis Meáin in the Aran Islands in 1865 and ended up as America’s first successful Irish vintner. His legacy still thrives at Concannon’s Vineyard in the Livermore Valley today – one of California’s oldest wineries. Directed by Neal Boyle. A unique, behind the scenes glimpse into one of the most important centres in world aviation communication, based in the Co. Clare townland of Ballygirreen. For the first time, our cameras have been granted exclusive access to the Irish Aviation Authority’s Aeronautical Communications Centre in Ballygirreen. The aviation radio officers profiled in this unique TG4 film handle more lives in a week than a surgeon cares for in a lifetime. Every year nearly 400,000 aircraft and millions of passengers fly across the North Atlantic and pilots must communicate with radio officers and air traffic controllers in one of the most important centres for world aviation situated on the Co. Clare coast. Brian Grays’ documentary looks at the complicated and pressurised world of transatlantic aviation and high-tech communications providing a rare look at the radio officers based in the small rural townland of Ballygireen on the Shannon estuary. Stradbally Hall, the venue for the (then) upcoming Electric Picnic Concert, is the setting for this week’s TOWNLANDS documentary. In ‘Stradbally Hall Days,’ we meet the 15th generation of the Cosby family living at Stradbally Hall, Co. Laois. Once upon a time, this was a life of leisure – hunting, fishing and entertaining but now, the ‘days of servants and footmen are over.’ This documentary gives us a rare look at what life is really like in the ‘big house’ in rural Ireland. Tristan Dowse, Irish Citizen, was abandoned by his adoptive parents after two year and is caught in legal limbo. As embarrassed Irish and Indonesian officials try to resolve his status, what is the likely future for Tristan? And what of his natural mother, Suryani, who placed him in an Orpahnage so that he would be properly cared for. This documentary examines the issues in international adoption and follows investigative journalist Ann McElhinney as she searches for Tristan’s Mum. Following the death and funeral of Pope John Paul II in April 2005, the College of Cardinals of the Roman Catholic Church met in Conclave, beginning on April 18th, to debate and elect a new Pope. On this historic occasion and coinciding with the Conclave, this documentary met with ordinary people across Ireland and Irish people in Rome and canvassed their views. What were the big issues they felt faced the Catholic church in Ireland? And what direction should the new papacy take? The documentary addressed aspects of people’s faith and aspirations for the future of belief in the context of declining practice, scandals in the church and increasing secularism in Ireland. Two camera crews travelled Ireland during the two days of the Conclave and met with different people of differing ages and backgrounds. A third camera crew was in Rome and captured the mood in St Peter’s square. This half hour documentary was broadcast on the night of April 24th, the day of installation of the new Pope Benedict XVI. “The aim of this work is to say to people where are you going, heaven or hell?” So says Mike Mullins a travelling evangelical preacher on his Bible bus as he journeys the roads of rural Ireland in Brian Gray’s documentary ‘Preachers’. The atmospheric slice of life film provides a unique look at the working lives and beliefs of three preachers set to the spiritual soundtrack of the original Man in Black, Johnny Cash. Brian Gray’s documentary ‘ONE VOICE’ gives an insight into a passionate young community of choral singers from the 32 counties of Ireland. Despite their diverse backgrounds, these young singers are united by their love of music, sense of fun and a passion in performing the great classical choral works to an extremely high standard. The final performance of the Irish Youth Choir takes place in the impressive setting of City Hall, Cork; 300 singers on stage with full orchestra. In the final documentary of this short series, John Bowman details the contribution of T.K Whitaker who joined the Irish civil service in 1934. A public servant in the true sense, he had a meteoric rise to the top in the Department of Finance and was instrumental in planning the economy. He played a pivotal role in diplomatic relations and was deeply influential in advising Jack Lynch on policy on Northern Ireland. Even in retirement, he has continued his contribution to initiatives as diverse as prison reform, scientific research and a constitutional review. The second programme of this series looks at the life and times of Todd Andrews. An unrepentant Republican, Andrews’ single-minded determination as a public servant made him an influential power broker in 20th century Ireland. From the ESB to CIE to RTÉ, he made his impact. Undoubtedly his greatest contribution to the building of the nation was in the bogs. Through the Turf Development Board (later Bord na Mona) he revolutionised the Midlands. Directed by Mary Brophy. In a short series on prominent public servants in 20th century Irish history, John Bowman tells the story of Sean Lester. A journalist with a Northern Protestant background, Lester was a Nationalist who joined the Free State government as director of publicity. In 1929, chance brought him to prominence in international diplomacy. Out of his depth in diplomatic circles, no French and meagre funds, his task was nothing less than to mastermind the Irish election to the Council of the League of Nations in Geneva. Directed by Neal Boyle. This documentary follows the award winning Bofield Ceilí band on tour to America for the opening of the Irish Hunger Memorial in New York City in July 2002. At the centrepeice of this poignant memorial is a 150 year old famine era stone cottage, which was dismantled carefully, stone by stone, and shipped from the band’s home in Bofield, Mayo across the Atlantic to Battery Park, NY. In 1998 the story broke of a potential new treatment for autism in the United States. Just ten days after receiving an injection of the Secretin hormone, an autistic child began speaking for the first time in over two years. Through the Internet, Irish parents heard about the treatment and were among the first in the world to avail of it for their autistic children. This True Lives documentary tells the story of Irish families who live with autism, their story of secretin and how they continue to search for answers. ‘Unlocking Autism’ documents what it means to live with autism. The documentary investigates the science behind the secretin hormone, meeting with doctors and autism experts in the United States and Ireland. Going home for the weekend strikes a chord with many people in this country. If you haven’t been part of the mini-exodus yourself, then you know someone who has. In this two-part documentary we follow six very different people who travel on Fridays after work or college to spend the weekend in their homeplace. Directed by Neal Boyle. Described by one critic as ‘Ballykissangel meets Apollo 13’, this short (26 minute) film is based on the extraordinary story of a Donegal ‘ham’ radio enthusiast who made contact with a Soviet cosmonaut stranded on the MIR Space station during the summer of 1991. This radio friendship coincided with the growing political crisis in the Soviet Union. Mission Control in Moscow wasn’t very forthcoming with information but his ‘ham’ radio friend in Donegal kept the cosmonaut abreast of developments. ‘MIR FRIENDS’ takes these true-life events, embellishes them with a dramatic climax, adds a few quirky characters and tells the story with a wee smile. 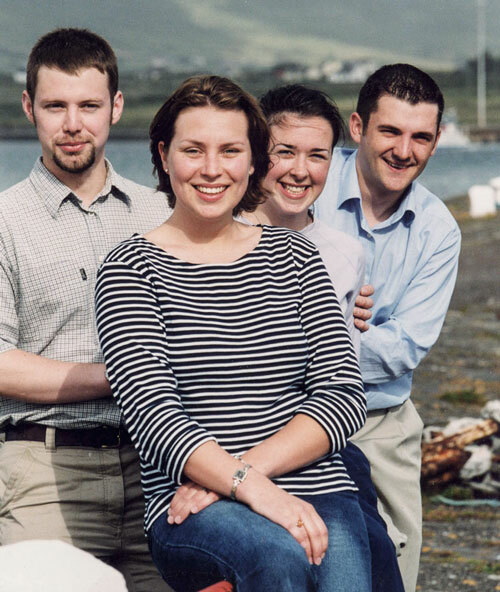 Produced as a ‘Short Cut’ funded by RTÉ and the Irish Film Board, the film premiered at the Cork Film Festival, earned an IFTA nomination and came third in the Galway Film Fleadh in 1999. St. Paul of the Cross dedicated his life completely to God and worked tirelessly for 55 years to establish the Congregation of the Passion. Actor Martin Sheen traces Paul’s life in Castellazzo in the North of Italy, scene of Paul’s special retreat of 40 days and 40 nights and the place where he had a vision of the Cross and Heart with the name of Jesus – the characteristic sign worn to this day by members of the Passionist Congregation throughout the world. Martin also visits Monte Argentario, the place where Paul found a quiet life of solitude and meditation. “John Charles Mc Quaid – What the papers say” is a major documentary film in two parts (each of forty minutes duration) exploring the McQuaid papers. The two films are written and presented by broadcaster and historian, John Bowman. No history of twentieth century Ireland could ignore the often-controversial significance of John Charles McQuaid, Archbishop of Dublin from 1940 to 1972. More that any other figure, he represents the tension between church and state, liberal and conservative, old and new Ireland. 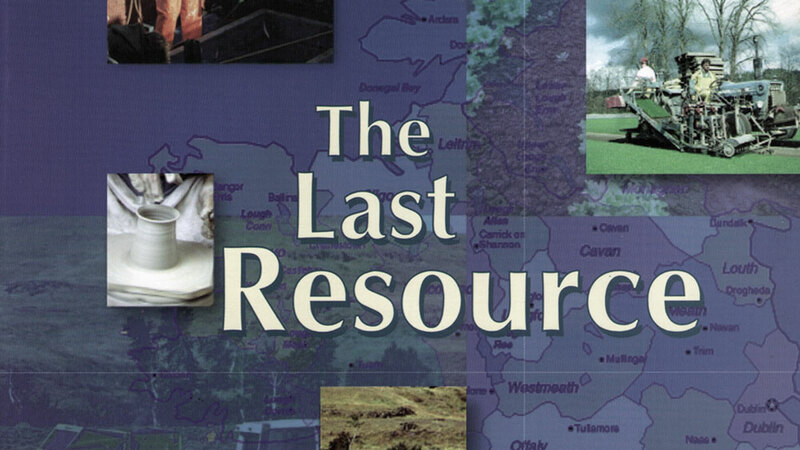 A series of documentaries profiling rural communities and their dependence on a single resource. Each programme was presented by someone with either a local or national profile, or a person with a natural empathy for the people and place featured. The first programme in the second series ‘Market Gardening in North Co. Dublin’, presented by actor Brendan Gleeson, won Esras the Agricultural Journalist of the Year Award in 2000.